Observer Matrix (Discontinued) | VIAVI Solutions Inc.
Matrix achieves all this by exploiting the core Network Instruments competency; placing high-end functionality and components directly into a custom hardware design rather than implementing an invariably slower solution in software. Wrapping it all together in a modern GUI makes it unique in the industry and offers the best of both worlds—extreme performance and incredible usability. Observer Matrix has been designed from the ground-up with an entirely new HTML5 interface that makes configuration, programming, and management incredibly easy. Plug-and-play simplicity translates into a total typical setup time of ten minutes. Everything about the user experience is painless; change traffic patterns in 2 seconds, load balance in 2 mouse-clicks, replicate traffic in 1 mouse click. We do this all with a new "rules" based paradigm that integrates traffic flow configuration and management into a single, centralized approach rather than scattered across ingress and egress ports. 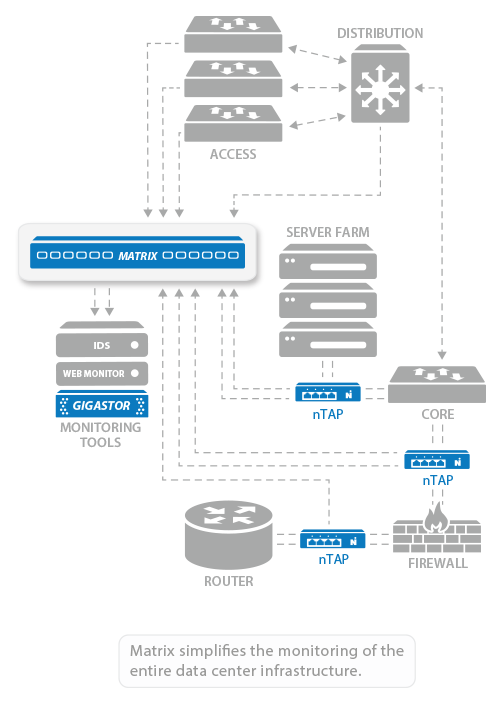 Getting the optimized network data to the right tool with a network monitoring switch has never been so simple. All good network monitoring switches include capabilities like aggregation, load balancing, speed conversion, and traffic replication. The Matrix does all this and more. Developed to provide deep packet manipulation, every Matrix includes user configurable de-duplication, packet trimming, multiple time-stamp options, and the most powerful yet simple to use filtering in the market. We've made constructing even the most complex filter expressions a snap, allowing you to write Boolean expressions directly in BPF syntax, or leverage the GUI and use variables including clients or servers, applications, packet length, and port number. When we say it scales, we mean it. Matrix is designed for trouble-free growth up to 24 ports per enclosure. What's more, the product can fully support gigabit or 10 Gb, without restrictions on whether the ports act as network or tool connections. Up to 8 ports can act as tool ports simultaneously. Additionally, multiple Matrix units can be daisy-chained to grow beyond 24 ports for larger data center deployments. 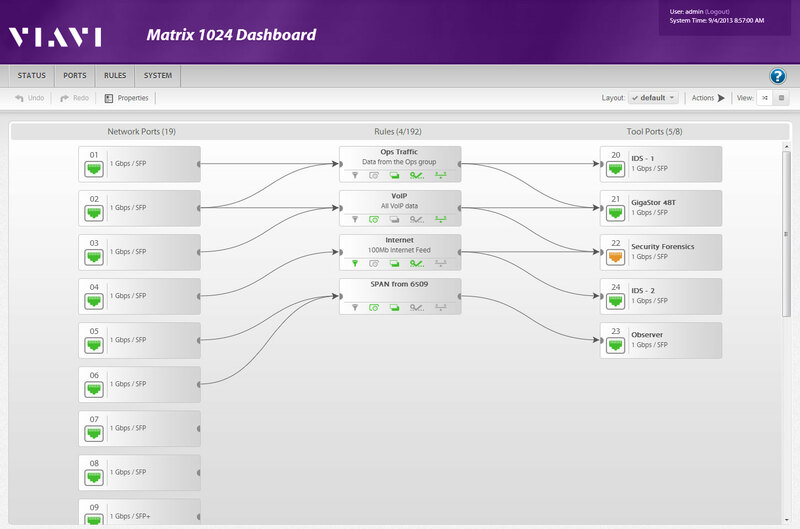 Matrix is completely designed and built by our expert hardware and software development teams. This results in a significant cost advantage compared to competitors. Add-on port license upgrades are also sensibly priced ensuring your monitoring dollars go further. Another tradition we maintain is to never nickel-and-dime customers with more fees to acquire functions that should be included right out of the box. Our pricing is all inclusive. 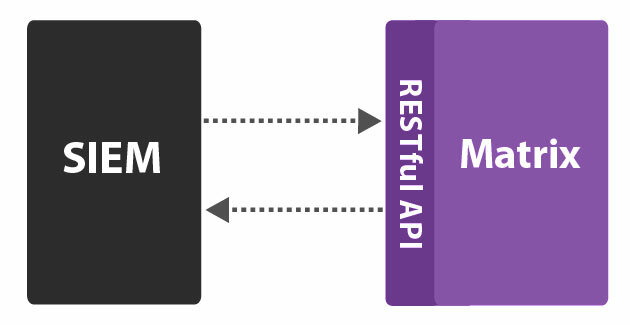 We've included a RESTful API enabling the Matrix to share information with third party apps and/or enabling it to be managed and configured remotely by higher level management tools. 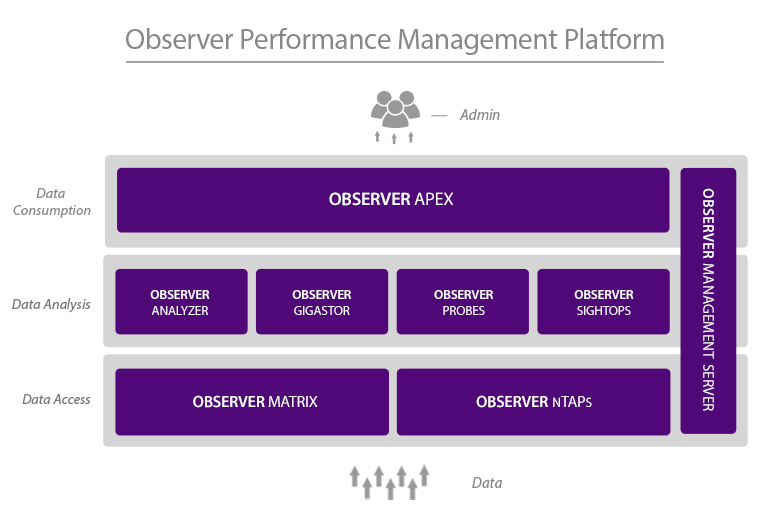 Observer Matrix integrates with the entire Network Instruments Observer Platform. Specifically, it perfectly complements Observer GigaStor, maximizing the value of the appliance by manipulating packets (de-duping, slicing, etc.) and transmitting only relevant data to the device, thereby freeing up its system resources to focus on what it does best; applying advanced analytics for rapid troubleshooting. Likewise, the value of any real-time or back-in-time solution tasked with inspecting packets and their contents are greatly enhanced by the Matrix. Examples include load balancers, IDS, DLP, or firewalls. Observer Matrix can be quickly mounted in most rack units. Once installed, it's easy to add network SPAN or TAP links on the ingress ports along with various monitoring tools on the egress ports. Status and configuration can be done via a CLI or with the HTML5 interface via most popular web browsers. Be sure to account for rack space availability. Matrix is designed for easy mounting within a standard rack unit, its small footprint consuming only a single 1U of real estate. Now cabling to and from the Matrix can begin. With sufficient ports licensed and enabled for your gigabit and 10 Gb network/tool connections, it's a simple matter to complete ingress and egress connections. 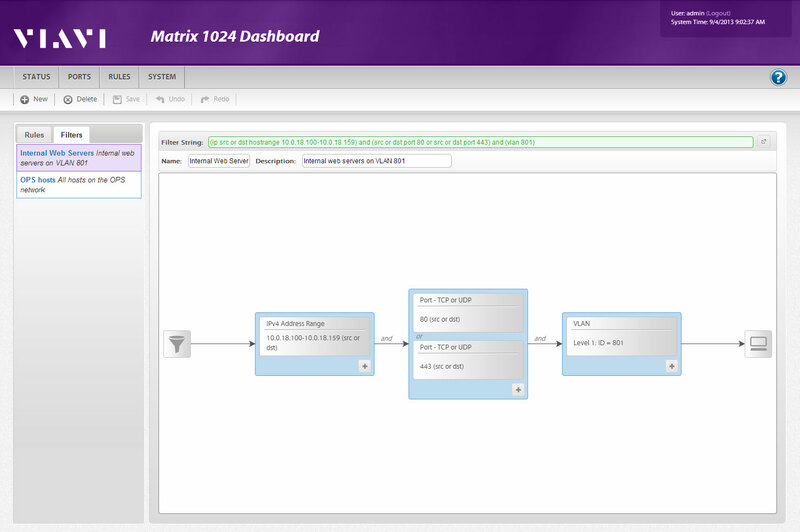 Observer Matrix's user-friendly design is clear when it comes to configuration options. Units can be purchased partially populated, and iteratively increased in the field to a maximum of 24 ports. All activated ports are fully functional with all features enabled. 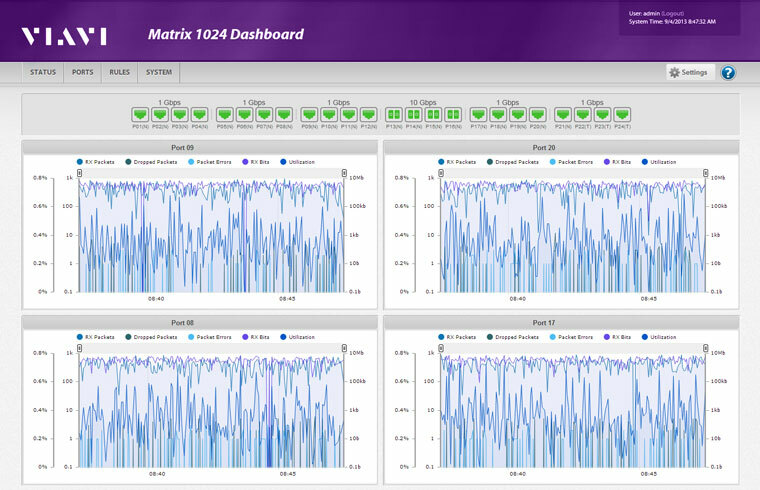 To monitor more than 24 ports, users can daisy chain multiple Matrix units for large data center deployments with numerous monitoring points and/or tools. There are no architectural limits to the number of Matrix units daisy chained. Observer Matrix is a 1U network monitoring switch capable of supporting up to 24 network or tool ports. Large deployments in excess of 24 ports can be achieved by daisy chaining connecting multiple 1024s. The smallest configuration is eight ports, but units will be configured and shipped in various sizes and speeds. There is no restriction on how any given port is configured. The Observer Matrix is an in-house designed network monitoring switch enclosure capable of supporting up to 24 ports of network and tool traffic.